So in this article I'm going to be reviewing all of the top zip line kits from all across the internet. I'll be rating them by customer reviews, durability, and value for the money. My goal is to give you the most information that I can so that you can make the best decision when you buy a zip line. First, I want to point out that most zip line kits are for kids, many parents or grandparents see their big backyard and want to put something back there that will keep the kids active and engaged. Then the idea comes along that they will install a zip line. The problem is that there are so many different types that it can literally make your head spin, especially if your inexperienced in the zip line world of terms and etc. I want to make it easy for you to sort through all of this zip slang and buy a zip line that's right FOR YOU. Many people are concerned about safety, but the bottom line is almost all of the zip line kits are safe except for a few which I'll point out later in this article. The next concern is price, the issue with price is that, yeah, you can buy a $1000 zip line but the thing you don't realize is they all pretty much use the same type of material - and parts. So don't be fooled by the price, just because it's more expensive doesn't mean it's better. Okay now for my list of researched zip line kits that are the best bang for your buck. Does not withstand weight limits over 250 lbs. I rated the Alien Flier zip line kits at number 1 because they are literally the most kid-friendly, durable, and best on price that I can find on the market. They are super easy to set up, they require little to no tools, and everything you need comes in the kit. 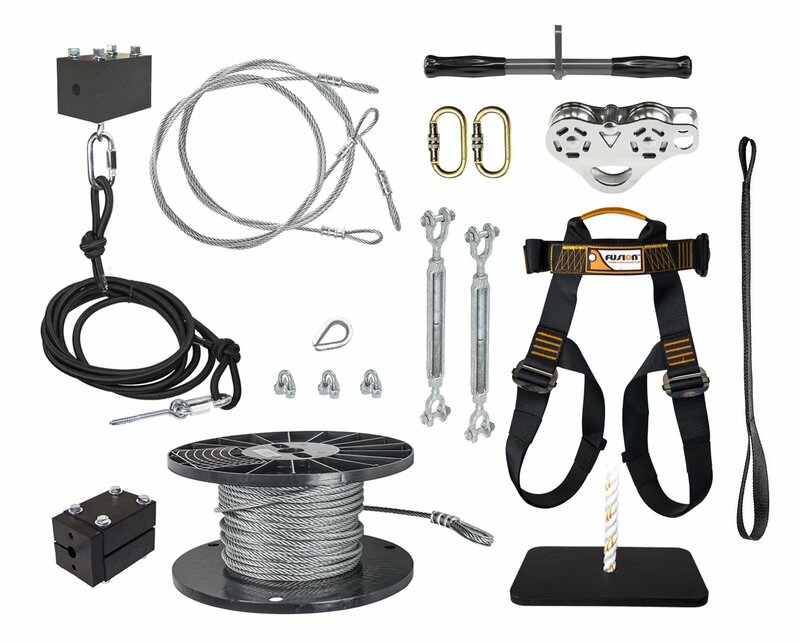 Unlike most zip line kits that use a turnbuckle, this kit uses a ratchet system that is user friendly. The kits also come with tree-protectors so you don't have to worry about the kit killing the tree over time. The kits are portable which means that they can come down in the winter and back up in the spring. By allowing the kit to be stored it extends the life of the kit by years. I waited for the best feature for last, these kits come with a speed control trolley which is operated by a trigger on the trolley handle itself- this allows small children and those who are a bit uncomfortable on a zip line to control their speed while riding. This is especially useful in the 200 ft zip line kits, the kits have a weight limit of 250-275 lbs and range in size from 100 ft - 200 ft. It also includes difference seating arrangements such as the disc seat, flexi seat, and the harness system. These kits came in second because they are the most durable for the money. If you look at comparable kits at this caliber you will see that these kits are made of the same parts but they're less expensive. They come in sizes ranging from 100 ft - 500 ft and the standard cable size is 5/16". This ensures a 325 lb. weight limit and gives the (ahemm) heavier folks some more options. The kit is good for kids being that all of their trolleys come with handles. The unique thing about these kits is many people tend to want to customize them, there are now pink trolleys, high speed trolleys, fancy harness systems, etc. They are for the more experienced zip liners because their system takes a few more steps to install. They use the turnbuckle tightening method which has become fairly unpopular over the years but works just as well. These kit will literally last you a lifetime because of how well they are built and are fairly low maintenance. These kits also come with different attachments such as harnesses, and various seating options. These kits are fairly straightforward, they include everything you need to set up your zip line except a stop block. If you do plan on purchasing one of these kits you should definitely make sure that you purchase some type of slowing mechanism separately. This may include a spring stop, or a stop block with bungee. Another aspect of this kit that I'm not too crazy about is the fact that it only includes a trolley, there is no type of seating arrangement for younger children which could potentially be dangerous if the child falls of their hands slip off the trolley. 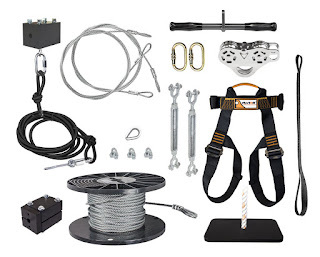 When installing this kit I would be particularly careful that you follow the 6% grade rule so that there is not much height between the zip line and the ground to prevent potential injuries. This kit comes in sizes ranging from 50 ft to 200 ft, and the installation is on the fairly complicated level, it offers no protection for the trees and also uses a turnbuckle. If you plan on purchasing this kit be sure to buy tree protector blocks to ensure that the tree does not die after a year or so of use. Well, I hoped this helped you clear up some doubts about the Best Backyard Zip Lines and if you have any questions please don't hesitate to contact me through the contact form on the bottom of my blog! This was so helpful! Thank you so much for taking the time to write this, I went with the Alien Flier and my kids looooove it.